From all accounts, Saturday July 1, 1933 was very hot and muggy. When nighttime came, the situation did not improve. 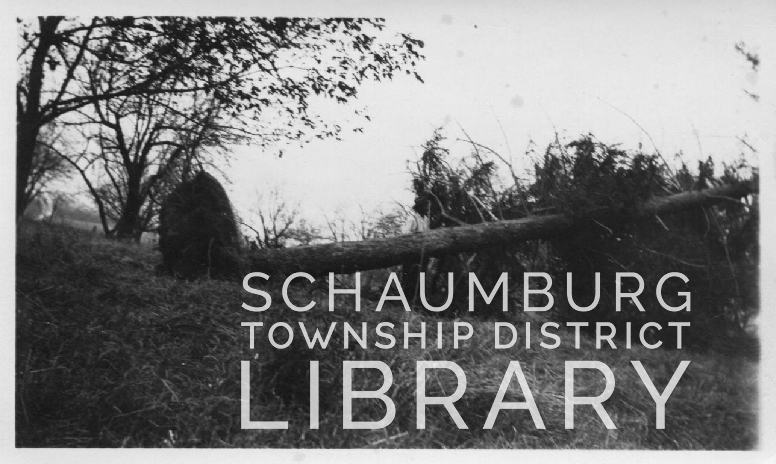 By early Sunday morning, the farmers in Schaumburg Township were awakened by almost constant lightning and high winds. 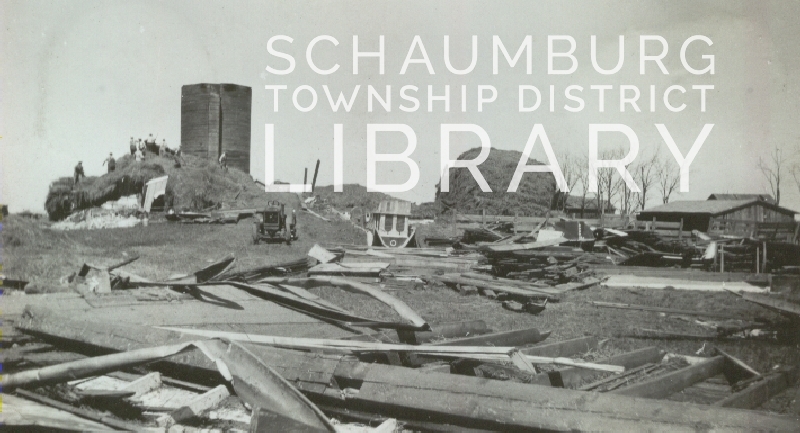 Schaumburg Township was most severely hit in the southeast quadrant of the township. 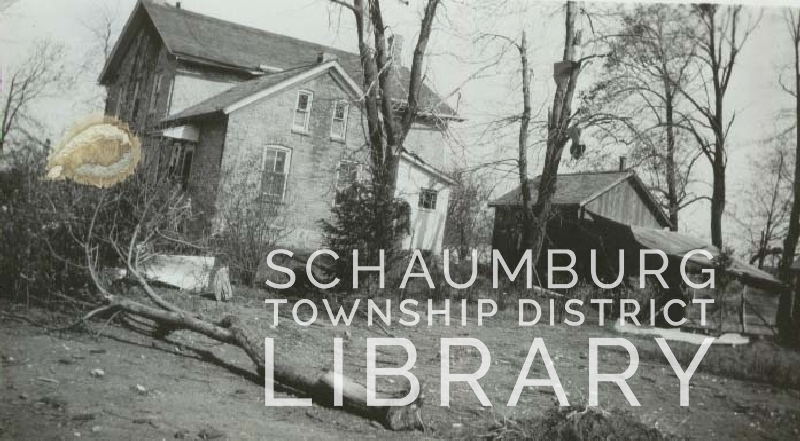 The area was bordered roughly by Wise Road to the north, Schaumburg Road to the west and township boundaries on the east and south. In fact, it appears to have come in through the south along Roselle Road, struck the Piske and Nerge farms along Nerge Road and then veered north towards the Pfingsten farm on Plum Grove Road, eventually passing through the Botterman farm just south of Higgins Road on the Elk Grove Township border. When the storm had passed and it was possible to venture outside, another world awaited the residents. Wheat, corn and oat crops were completely destroyed by the torrents of hail that were “big as fists.” Piles of hail were scattered around. Trees were stripped bare of their leaves and, in fact, the Adolph Link family reported that one exterior wall of the house was completely plastered with leaves.” [Genesis of a Township, Marilyn Lind.] The photo below shows an overturned tree on the Thies farm. The photo above is of the Pfingsten farm and shows how the trees were stripped of their leaves and/or uprooted. Fortunately, the Pfingsten house still stood as did some of the outlying buildings. The house had been built with bricks leftover from the construction of St. Peter Lutheran Church in 1863. A number of local barns and silos, though, were irreparably damaged. According to the Arlington Herald article, those who lost their barns and buildings were Fred Pfingsten, two barns; Ferdinand Panzer, barn; Louis Nerge, barn and windmill; the Schmidt brothers, top of a barn and silo; Albert Brendemuhl, horse barn and two sheds; Charles Meirs on the Walter Nerge farm, barn and tool shed; Piske brothers, barn; Charles Stocke, barn; Herman Bottermann Jr., barn; and Elmer Moehlenbrandt, barn. In the photo at the top of this blog posting, you can see the devastation on the Pfingsten farm. The cupola from the barn is lying upside down in the middle of the picture. Timber lies everywhere. The top is off of their wooden silo–the first of its kind to be built in Cook County. Workers are trying to salvage the piles of hay from the barns so that the animals still had food. Unfortunately, a number of horses and cattle were killed. Despite the fact that many farmers were using mechanized equipment by the early 30’s, all of them still used Belgian draft horses and Percherons for work around the farm. Accounts in the paper vacillated between the benefits of having the animals in the barns or outside. Many farmers had their cattle herds outside because of the stifling weather. These animals “suffered badly from cuts and bruises from flying hailstones. Livestock… broke through fences and even fought to get within barns and sheds.” That is the degree to which the animals were panicked. Viola Meyer mentioned that Emil Lichthardt, a neighbor, came by the day after the storm to tell them their cows were all mixed up and would have to be separated somehow. Six of the aforementioned farmers who lost buildings also lost animals. The greatest loss occurred on the Louis Nerge farm as seen in the picture above, where five horses and a bull died or had to be put down. One can imagine it was especially painful to lose the large draft horses. These animals had personalities of their own, typically lived long lives and were the farmers’ constant companions and supply of power. Yes, they ate their weight in food but the effort they gave was unsurpassed. With the loss of crops, gardens and orchard produce, it was difficult to decide what should be replanted. It was almost too late in the growing season to replant corn, though many turned to 60 day corn and some to 90 day corn. Others planted soybeans and buckwheat. Carrie Gathman Ollman said, “Farmers had a lot of faith so they worked up the land again and planted the corn over… It did not get ripe but was all right for the silo.” The resulting silage was used to feed the animals in the winter. As far as gardens went, it is necessary to remember that produce was still crucial to farming families. They canned and preserved much of their vegetables and fruits and used them throughout the winter. By this time of the year, the stock from the prior year was already depleted and now there would be nothing new to add to the shelves. Keep in mind, too, that this was still the depths of the Great Depression. Using savings for the upcoming year to buy food for your family and animals was an unplanned expense. Making repairs and replacing barns and silos was even more costly. While many had insurance on their farms for the contingency of natural disasters, there were always more unconsidered expenses that came along. The farmers recovered but a storm like that couldn’t be very far from their thoughts when the weather was just right. One has to suppose that when it was hot and humid, and black clouds and green skies would start rolling in, dread would start to build in their chests. In fact, Ruth (Piske) Lake said, “For many years afterwards, our mother would pace the floor and make us go into the chicken coop or the basement if the weather was bad.” She was well aware that when dealing with a storm of that proportion, there was only so much one could do. Pfingsten photos are courtesy of Delores (Pfingsten) Pederson. Thies photo is courtesy of LaVonne (Thies) Presley. 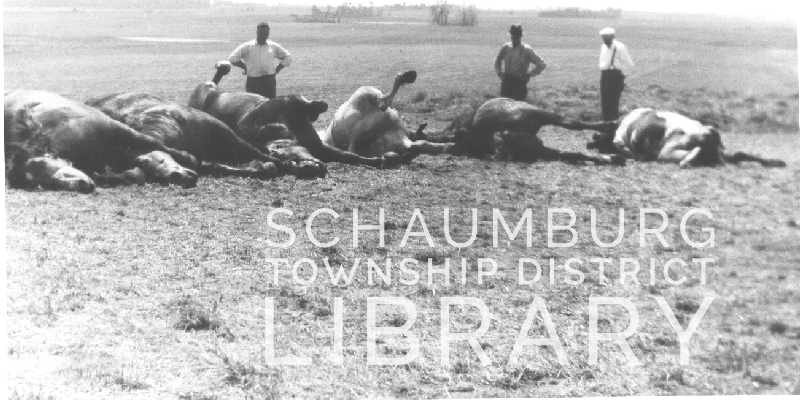 Horse photo is courtesy of the Schaumburg Township Historical Society. This entry was posted on July 29, 2018 at 7:00 am and is filed under Farms, Weather. You can follow any responses to this entry through the RSS 2.0 feed. You can leave a response, or trackback from your own site. Back in the 60’d Ed Piske was putting in most of the lawns in Sunset hills where his farm was. He used to tell tales of those storms to all us kids who loved by him….Thanks for posting the Photos! I want to join the Blog, didn’t see anywhere else, except to unsubscribe,which I don’t want to do,ha-ha. Loved the article, was sent to me from my sister Heidi! If you hover over the lower right portion of your screen while viewing the blog, a “Follow” button will pop up. Click on that. It will give you the option to Follow the blog. Welcome!